DUBAI, United Arab Emirates, Dec. 10, 2018 /PRNewswire/ -- Jet Aviation is supporting the unveiling of Boeing Business Jets' new BBJ 777X at the Middle East Business Aviation Association (MEBAA) 2018 show with a VIP cabin concept. The Jet Aviation design dubbed Shaheen, meaning Royal White Falcon, aims to elegantly blend modern and classic elements. Boeing Business Jets is launching its new BBJ 777X, along with Jet Aviation's interior design, at MEBAA in Dubai. The Jet Aviation Design Studio in Basel, Switzerland, partnered with Boeing Business Jets to support the unveiling of the new globe-spanning wide-body BBJ 777X. It features forward thinking technologies grounded in Jet Aviation's MRO and Completions Center capabilities and expertise. 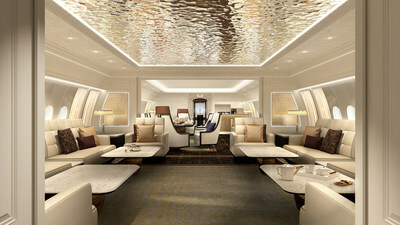 The interior concept takes advantage of the BBJ 777X's size; featuring lounges, a game and cinema area, a stately office, private work spaces, three guest bedrooms and a master suite that includes its own lounge, luxurious bedroom, spacious dressing/bathroom area and a very large shower and hammam. The interior is designed to accommodate 43 passengers plus a crew of eleven. "Like many contemporary homes, our design incorporates modern and traditional elements that are contrasted through the use of colors, materials and the general design intent," explained Director of Design at the Jet Aviation Basel Completions Center, Elisabeth Harvey. "This is intensified with extremely detailed, very light ceilings and sidewall treatments with patterns and traditional paneling structures, opposing the darker wood floor which replicates the ceiling pattern with fine marquetry inlays. Light sidewall and bulkhead treatments are balanced by minimalistic but colorful furniture with delicate detailing, such as engraving inlays and floral fabric inserts. "Artwork, such as the balloon rabbit by Jeff Koons in the forward dining lounge column display and the deconstructed mirror by Matthias Kiss in the forward master lounge add to a playfulness throughout the interior. The result is a carefully orchestrated, playful and holistic combination of shapes, patterns and colors that brings our unique interior concept to life." Head of Boeing Business Jets Greg Laxton expressed appreciation for Jet Aviation's commitment to the highest design and completion standards. "Jet Aviation Basel is a very well-known and highly regarded completions center," said Laxton. "Their interior concept for our new BBJ 777X is a compelling combination of a beautiful design and the latest technologies." "In addition to features such as weight and space optimization through fiber optics and technology-integrated furniture, we incorporated forward-thinking concepts such as intelligent, digital LED lighting throughout the cabin, as well as OLED and Smart Glass technology on all the window panels, which allows the windows to be dimmed and virtual curtains or window shades to be displayed," says Matt Woollaston, VP Completions Sales. "We envision these and many other advances to functionality will be seen in cabins of the future, including gesture- or voice-controlled features to offer an enhanced customer experience." Jet Aviation Basel has successfully completed 28 VIP Boeing cabins in Basel since 1998. It was the first company to take delivery of a BBJ 787-9 for interior completions and signed its second completions contract for a BBJ 787 earlier this year. Jet Aviation is exhibiting at MEBAA in Dubai from December 10 - 12, 2018. 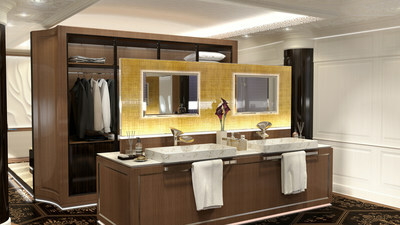 Renderings of Jet Aviation's VIP cabin design are on display at the Boeing Business Jet MEBAA chalet. Jet Aviation Basel is a world-renowned completions and maintenance center employing more than 1,400 professionals. The facility has in-house design and engineering departments, along with on-site cabinetry, upholstery, sheet metal, composite and paint shops. The organization is capable of outfitting jets as large as an Airbus A380 or the Boeing 747-8 series. It has already completed numerous Airbus ACJ319, ACJ320, ACJ330, ACJ340, and Boeing B737, B757, B767, and B747 aircraft, and is equipped for the B777 and B787. Jet Aviation Basel also provides aircraft maintenance and repair services for a wide variety of business jets. It is a factory approved service center by Airbus, Boeing, Dassault, Embraer and Gulfstream, with approval and capabilities for maintenance, RMU and repairs on Bombardier aircraft. The location also holds a jet aircraft repair station rating by the FAA #QV1Y440K, and the EASA #CH.145.0232 in addition to approval certificates of 28 other national aviation authorities.